Sins Invalid is a US-based performance project that incubates and celebrates artists with disabilities, centralising artists of colour and queer and gender-variant artists as communities who have been historically marginalised. Their new book, Skin, Tooth, and Bone – The Basis of Movement is Our People: A Disability Justice Primer is reviewed here by Sandra Alland. Photo of Leroy Moore by Richard Downing, text by Patty Berne and Sins Invalid, layout by Micah Bazant. After years of brilliant live performance, Sins Invalid brought us an excellent film about their work, and now – a groundbreaking book. 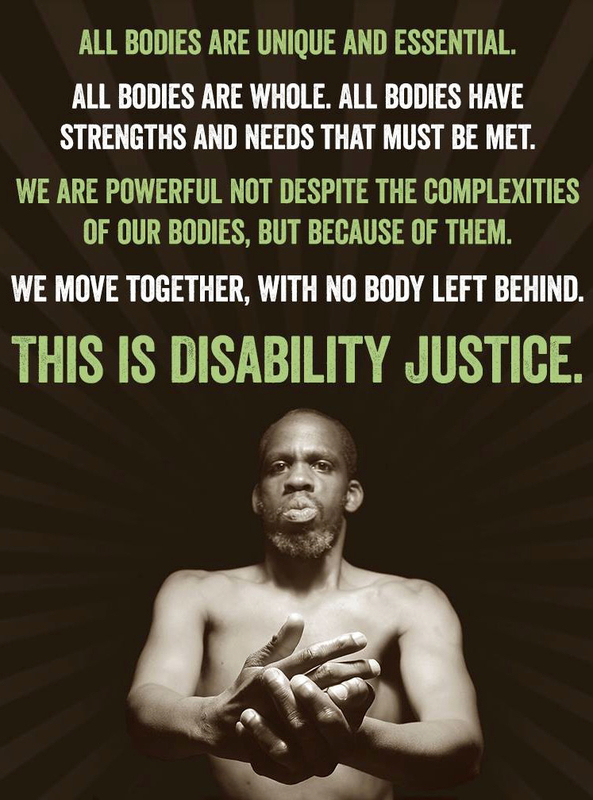 Skin, Tooth, and Bone gives an overview of what disability justice is, and more importantly, what it can become. The design is beautiful, and features a clear and uncluttered layout. It reads well as an e-book, with images and highlighted quotes to break up the potential monotony of text. The reader encounters gorgeous drawings by Micah Bazant and photos of disability activists like Leroy Moore (the ‘skin’); quotes, conversations and poetry from activists including Aurora Levins Morales and Neve Be (the ‘tooth’); and texts critical to the movement, including Principles of Mixed Ability Organising, General Guidance Regarding Access, and Sins Statement on Police Violence (the ‘bone’). As Stacey Milbern recounts in the foreword, the term ‘disability justice’ has been used and co-opted so often that its meaning and roots have become unclear. Sins Invalid published this guide not only as a resource for activists and disabled and D/deaf communities, but also as a reclamation of the term for disabled people of colour, and more specifically queer and gender nonconforming disabled people of colour – who originated and must remain at the forefront of defining disability justice movements. 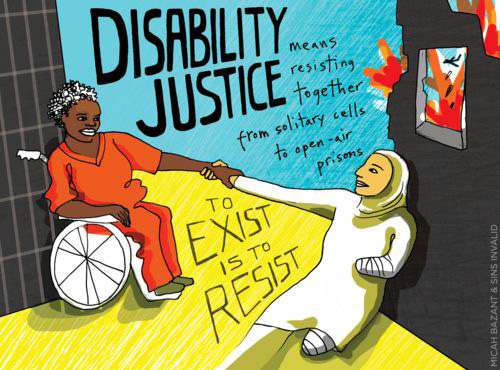 Sins have highlighted ten principles of disability justice: intersectionality, leadership of those most impacted, anti-capitalism, cross-movement solidarity, recognising wholeness, sustainability, commitment to cross-disability solidarity, interdependence, collective access and collective liberation. 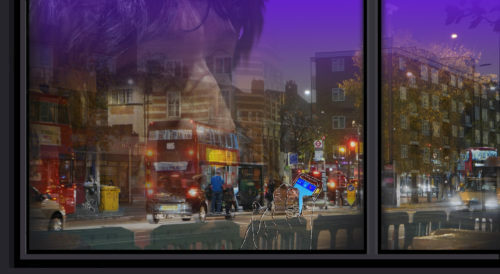 In the UK, like in the US, disability movements have arguably focused on cis, straight, white disabled people, and on liberal ideas such as rights-based strategies, which often fail to tackle the roots of inequality – and in many cases leave people like disabled asylum seekers and disabled trans people out of the conversation. Skin, Tooth, and Bone presents us with viable, inclusive and urgent alternatives to this failing narrative – offering insights and guidelines for both the non-disabled newcomer and the seasoned disability justice activist. To download any of Sins Invalid publications, visit sinsinvalid.org. To purchase printed copies of Skin, Tooth and Bone go to Flipcause.com or contact info@sinsinvalid.org. Click on this link to read Access Suggestions For Mobilisations (excerpted from Skin, Tooth, and Bone). Click on this link to read Access Suggestions for a Public Event (excerpted from Skin, Tooth, and Bone).